For the first time, a researcher at the University of Waterloo has theoretically demonstrated that it is possible to detect a single nuclear spin at room temperature, which could pave the way for new approaches to medical diagnostics. Published in the journal Nature Nanotechnology this week, Amir Yacoby from the University of Waterloo, along with colleagues from University of Basel and RWTH Aachen University, propose a theoretical scheme that could lead to enhanced Nuclear Magnetic Resonance (NMR) imaging of biological materials in the near future by using weak magnetic fields. Measuring spin is routine in current imaging devices such as Magnetic Resonance Imaging because nuclear spin generates magnetic fields. However, weak magnetic fields such as those at the atomic level are difficult to detect using current technology. Add noise into the field and the detection is more difficult. Yet, according to the new paper, when a magnet is placed into the mix, detection can be achieved with weak fields. "There is great interest in measuring the signatures of weak magnetic fields," said Yacoby, Distinguished Research Chair in Condensed Matter in the Department of Physics and Astronomy and associate member of the Institute for Quantum Computing at the University of Waterloo. "Our proposal could lead to better imaging for nanoscale nuclear magnetic resonance (NMR) on biological material in noisy conditions." Think about a heavy person sitting on a swing. A very strong person could push the swing. It's also possible for a smaller, weaker person to move the swing periodically with less force as each push results in a larger motion. This is how we swing ourselves – even with a weak source, it's possible to eventually get a large response. 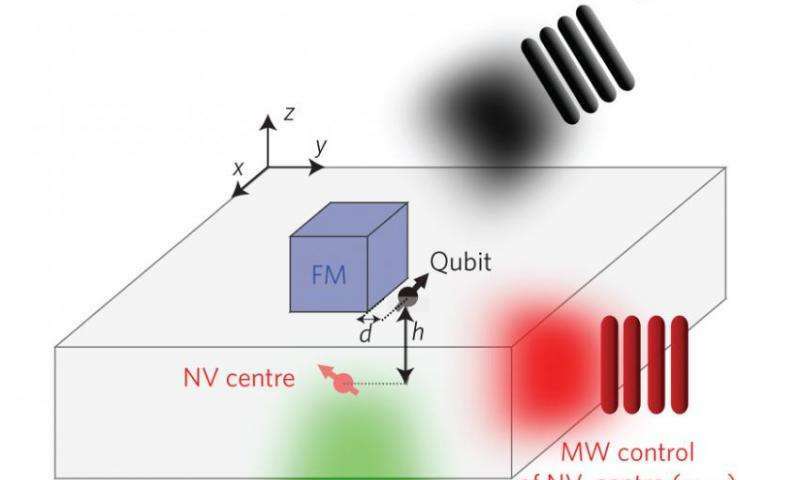 Yacoby and his colleagues theorize that by placing a tiny ferromagnetic particle between a nitrogen-vacancy quantum bit (qubit) magnetometer and the source – the nuclear spin – the sensitivity of the magnetometer is enhanced. The strongly correlated electron spins in the magnet and their collective excitation can be used to enhance the weak signal from the source. Modulating the source will slowly resonate with the magnet and start to build strength, just like the swing. A qubit magnetometer can then read the larger response of the magnet. Acting as an amplifier, the ferromagnetic particle can detect a single spin at a distance of 30 nanometres (nm) at room temperature. Previous attempts without a magnet required placing the detector impossibly close to the source, just 1-2 nm. Adding the magnetic particle allows the sensor to be further from the system, lessening the chance that the sensor will destroy it, and yet still able to detect a measureable signal. The paper theoretically analyzes the feasibility of the fully classical scheme. Conceptually the proposal is quite simple but, while the implementation has its challenges, researches believe it is far less fragile than a quantum scheme. These results, in combination with Yacoby's other research on improving resolution, could see enhanced NMR imaging of biological materials in the near future.